When running system reports in MarketingPilot and using IE7 or IE8 and you click on the print icon we were receiving an error saying “Unable to Load Client Print Control”. If this happens to you, here’s how to solve the issue. The issue is happening because of the Microsoft Report Viewer 2008 that is installed on the Web Server. 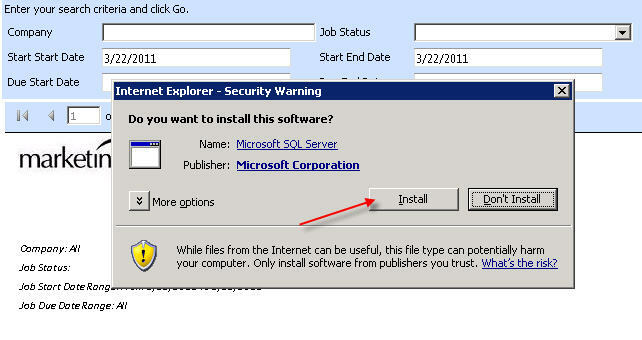 To resolve the issue you will need to install the Microsoft Report Viewer 2008 SP1 Redistributable on the Web Server (http://www.microsoft.com/downloads/en/details.aspx?FamilyID=bb196d5d-76c2-4a0e-9458-267d22b6aac6). Now you should be able to print custom reports. This entry was posted in Reporting Services, Shortcuts, Tips & Hints, Troubleshooting, Uncategorized by tanyawanninger. Bookmark the permalink.